The handsome city hall of Williams, CA, on Sunday morning. Williams’ quixotic declaration tilts at the windmills of the political establishment in Sacramento, in the same way that Oregon’s rural counties’ lodge hopeless complaints against the policies imposed by the Portland-Corvallis-Eugene axis. 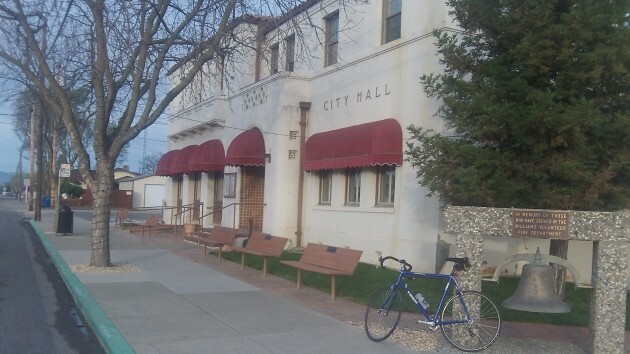 Lately, though, at least five northern California counties have filed petitions in Sacramento stating their desire to leave the state and form a new one. Siskiyou and Modoc were the first, last year, and in January Tulare, Glenn and Yuba joined them. Others that have been mentioned as possible candidates are Del Norte, Humboldt, Trinity and Shasta in California, along with Lake, Klamath, Jackson, Josephine, Douglas, Coos and Curry counties in Oregon. 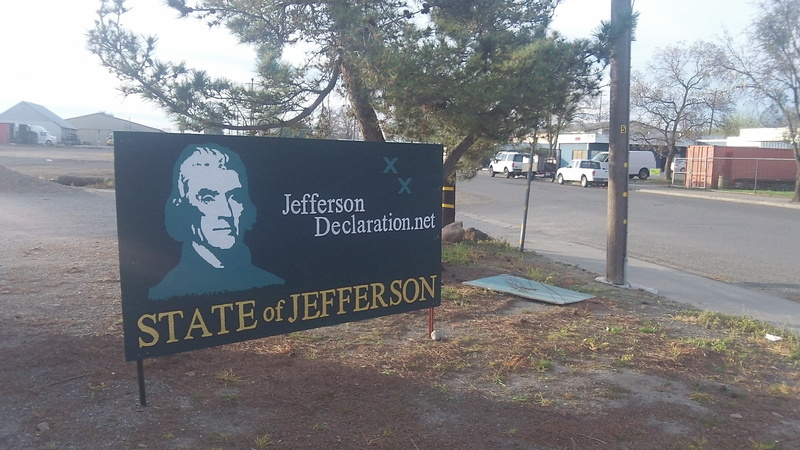 In January, the Sacramento Bee said a freshman assemblyman, Republican James Gallagher of Yuba City, talked with the Jefferson proponents. He said one way to give rural counties more clout in state capitals is to elect one senator per county, a system that California had until the Supreme Court ended it with its one-man, one-vote decision in the 1960s. A street-corner banner in Williams. I agree the state of Jefferson makes sense, but I don’t think it will be allowed to happen as it would dilute the power of the east coast states a bit. I believe some proposals include sourthern Oregon counties in this state as well. I have talked to some California friends who have also said there is a desire in some groups to divide that state in three (northern, middle, southern) — which also makes sense to me, as the economies of the three areas are quite different. If that should happen in southern Oregon, I’d consider moving back!